Are You a Leader or a Laggard in Quality IME Practices? In workers’ compensation, the independent medical examination (IME) serves as a powerful tool to help claims professionals make difficult determinations, regarding the cause of an injury, appropriate treatment, impairment and disability, as well as return-to-work issues. To make these determinations accurately, the industry needs a quality IME process that preserves the original intent of these exams – which is to obtain an impartial, expert medical opinion that helps determine the next step in a case. However, a quality divide currently exists. On one side of this divide – the “leading” side – are organizations striving to establish and consistently adhere to quality standards. On the other side – the “lagging” side – are those unaware that such standards exist and ending up with less than optimal IME results. What’s at stake is a claims process that gets bogged down and stalled. Claimants may seek legal representation. Opposing sides may obtain IMEs to substantiate their respective opinions. Sentiments of contention and suspicion arise, with some WC professionals feeling as if the exams further complicate cases, rather than bringing about clarification. Injured workers get caught in the middle – not receiving the care they need in a timely manner. Three stakeholders play an integral role in ensuring a quality IME process. Whether these parties are leaders or laggards is largely dependent on whether they acknowledge and support the quality criteria under their control. The industry requires greater awareness, understanding and support of the key factors contributing to quality. 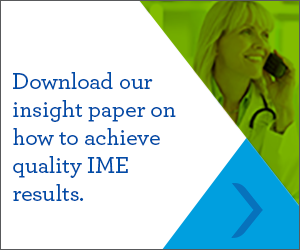 In our recent insight paper, we outline the best practices that enable organizations to consistently achieve quality IME results and to garner the benefits therein. Adhering to these best practices must become a priority. Otherwise, complex claims have a greater risk of becoming prolonged, complicated and costly — and injured workers could be in jeopardy of not receiving the care they need to recover and return to work. Michael Valasek is vice president of the IME Division at Genex Services. He is the former president and CEO of Med-Eval, which was acquired by Genex Services in 2016. With over 17 years in workers’ compensation and healthcare, he provides organizations with access to quality medical legal opinions through enhanced service and workflow technologies.